that teeny little screw thingy that holds sunglasses together. You know the one, that sits right at the corner and is always the first to go, leaving you disappointed and heartbroken because it's nearly impossible to find? Yep, that one. Now, which one of us was unfortunate enough to have our glasses break? Was it I, with my funky discount glasses from Forever 21? Or was it Simon, with his slick black Raybans that cost shoppers $$$ just to breathe the air in the store? (At least that's how I imagine it works, I've never bothered to buy expensive sunglasses in my life). Simon in his Raybans before they split like The Beatles circa 1970. What, you thought it was my humble pair? Huzzah! 'Twas not. My old faithfuls held together just fine, thank you very much. Driving through the sunshine without sunglasses was doable but not exactly comfortable, so we set off on our noble steed (a motorbike that also ironically lost an important screw whilst we were driving and had to be replaced) to find Mr Man some new glasses. In between food stops and napping, we lazily looked for a pair of glasses at Deus Ex Machina and a few other boutiques, and whilst I found several funky but woefully overpriced pairs, Simon managed to find... absolutely nothing. Though we had taken a break from Singapore and all of its fancies, we decided to stop by Potato Head Beach Club for lunch, since I had only been to the Potato Head Folk restaurant in SG. 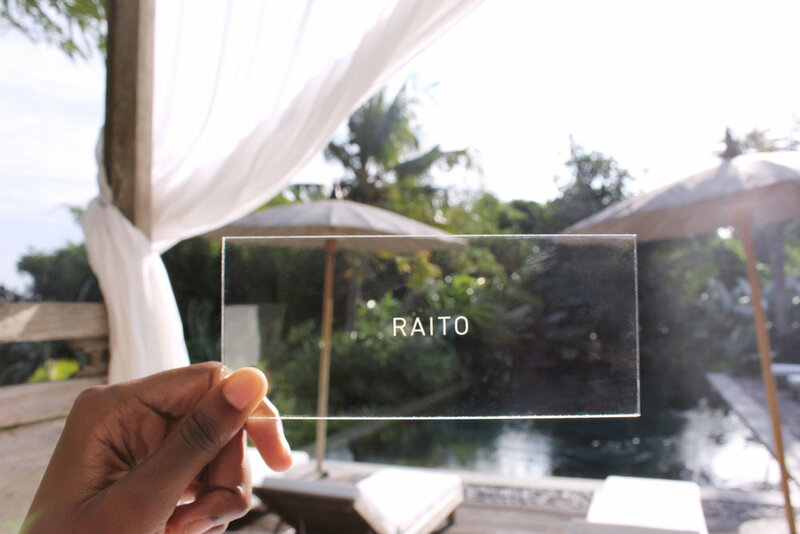 It was my first time in Bali, so we had to do all the stops, even if it felt eerily like being back on Sentosa Island - the same fifty-shades-of-sunburnt expats in designer casual wear, the same neither-here-nor-there menu, the same relaxed air of wealth, and the same pool that one too many people had been in. 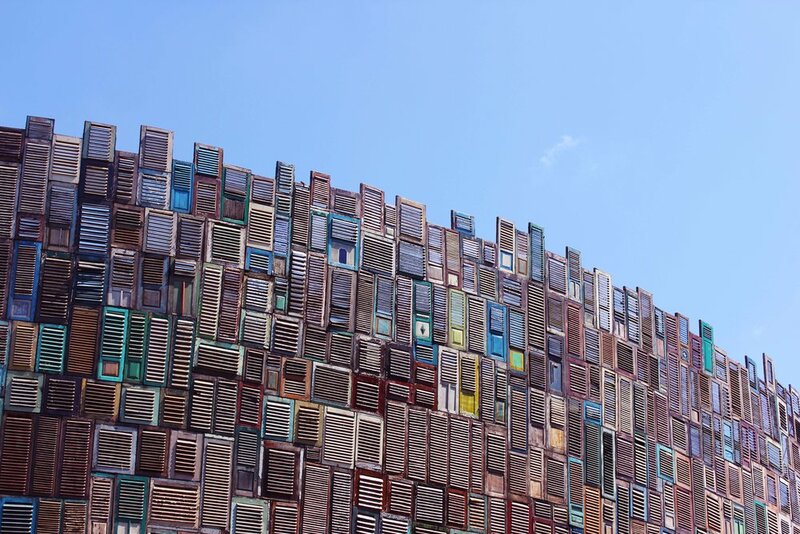 Though the decor was very cool, especially the stunning window-shutter patchwork facade, we didn't stay too long lest we caught Yellow Fever from the French guys in the pool. On our way out, we passed by Escalier, a well curated boutique that was sort of "Scandinavian hipster meets pastel Tokyo tumblr girl in LA" (they should employ me as their publicist, amirite). As a last attempt, we decided to try on a few more sunglasses just in case. I'm sure Simon would have bought a decent pair ages ago, but unfortunately I firmly believe that you can't buy something you use every day unless it makes your heart beat like an anime schoolgirl in love, so I vetoed practically everything. Then, FINALLY, we found something we both really liked from Raito. It wasn't a love at first sight, but no matter which other pair he tried on, we kept coming back to one particular brand. The more times he took it on and off, the more it grew on us. Even the store attendant was in on our nodding (because you don't just drop a 'hunnit without a second opinion)! It was the type of pair that you kind of just have to look at, then squint, then tilt your head to the side, then nod, then squint at again, you know what I mean? Like, it's different... but I like it. After a few minutes of making poor Simon stand and turn whilst the attendant and I discussed, we finally bought them! Now imagine my excitement when she put them into their box. The glasses sat in a silver box with a suede-like interior, which then fit into a slightly larger clear case with a slide-in cover. Both boxes had the name printed on top so that when they sat together, it created a shadow effect on the writing that made me weak. Firstly, you should know that I have a weird obsession with boxes. I literally got a hat box for my 17th birthday. No hat inside, just a beautiful round box and I loved. it. I'm also a huge nerd about packaging design, so I was squealing with adoration inside, whilst on the outside I kept a cool and blasé demeanour because obviously this is Bali, dahling. I of course had a field day back at the villa, taking a million photos until Simon woke up from his nap, then coaxing a couple photos out of the grumpy ol' man too. I must have looked insane with my little photo shoot, muttering to myself the entire time about how brilliant the box was. I probably even danced a little bit, who knows. I just get really excited about good design, I can't help it! The sunglasses also have a detachable feature, where you can turn them into regular glasses if you slide off the top, which gives them this cool ridge that I think really adds character. 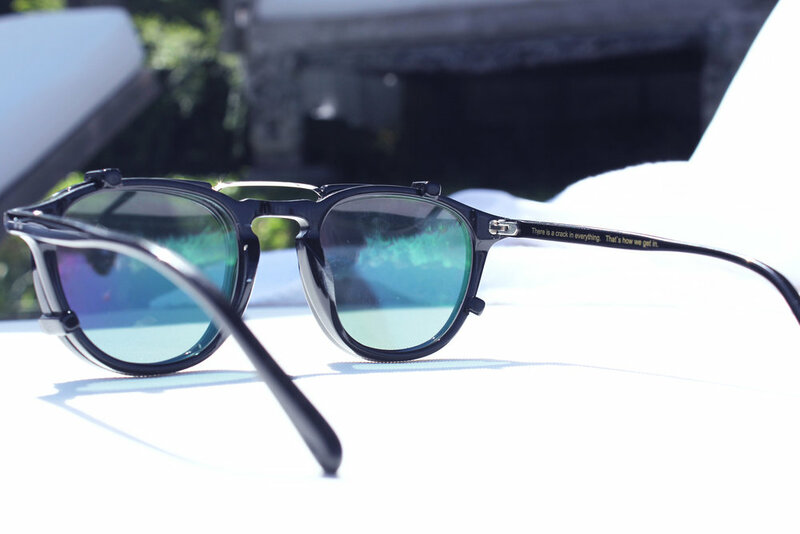 I definitely prefer thinner temples on glasses, unlike the thicker style of Raybans. It's just more elegant, unlike the billions of Rayban copy-cats that have become the mainstay of frat boys, teenage girls and Spanish dudes named Pablo, which have sort of cheapened the look. A high nose-bridge hardly ever looks good on me, because I think it definitely suits a more angular face. I mean, Simon has a jawline could cut glass whereas mine could probably only butter some toast, so normally I just end up looking like a Minion with a tan when I wear it. However, even when I steal his glasses for a few hours, they actually look quite good on my face! I'm definitely thinking of getting my own pair soon, and for that I want to do a proper shoot that aligns more with the company's aesthetic (you should check out the website and Instagram, I love their visual vibes). They don't have a retail space in Singapore and their online store is currently sold out, but I'll keep you posted! And so, after days of searching across the landing, slightly sunburnt and in despair, we were losing all hope! (can you hear the violins playing yet?) Then, like an oasis in the desert, we stumbled into the store and found a pair in the most unexpected moment! "there is a crack in everything. that's how we get in.